Social media is a cheap way to market your company, services, and products. It may be a little time consuming, but it pays off quickly. You can easily double your clientele in such a short time. Pros- fast results and it&apos;s fairly easy. There is a lot potential. Cons- there are certain norms to follow so you need to know the social norms to be successful. More social media options come up and some are duds. You can easily waste a lot of time if you don&apos;t know what you are doing or if a social media outlet fails. D2L is an eLearning authoring tool that many colleges use. Instructors build their course content in their shells and they can share their content easily with other instructors. It&apos;s great for discussions, quizzes, and papers/homework. You can even make students turn their papers into a plagiarism checker. It does have a blog section, but the blogs are not tied to grades or even a course. It does rooms chat rooms. Pros- It&apos;s fairly easy to use. You can share your content and do your own course copy. Cons- course copies are pretty touchy. Perhaps this will change in a future version. It would be nice to see blogs connected to the grade center and a course. More and more higher ed students are purchasing MACs. Could it be fore sales or promotion reasons from Apple or the simplicity and versatility of the Apple products for students? In a 2006 Princeton study, it was found that students looked to MACs for stability, unique looks of computers, prior use of iPods, and for being user-friendly. Apple gives students a 15% discount which also attracts the student population. Additionally, there are so many new free Apps to help students get organized, study, and find resources while in college. All of these reasons and Apple's continued innovation in educational technologies suggest that we will continue to see an increase of MAC usage on campuses. ECAR did a survey in 2011 and found that 31 % of students under the age of 25 use MACs while only 13% over the age of 25 use MACs. CNN Money did a study in 2010 and found that 27% of laptop owners have MACs, 14% of desktop owners have MACs, and 47% of those planning to purchase a new computer are looking at MACs (exactly where Dell was about 5 years prior). Other studies show higher results: one study showed that 70% of freshman purchase MACs. That study seems a bit high and had fewer students than the CNN study. Personally, I'm a MAC user at home and a PC user at work. It is frustrating when something in my classes doesn't work on a MAC and only works on a PC. It seems that Universal Design wasn't considered in the course creation. Universal Design is all about giving students tools that fit their learning styles and needs; usually considering students with disabilities or second language learners. The idea is that the instructor makes the content available to all users. For example, a video without captions isolates hearing impaired students. In the same idea that the video should have captions so all students are included, then shouldn't the video be able to play on a MAC? 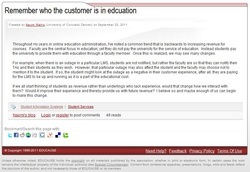 What about considering the student's operating system? The MAC user population is certainly large enough to consider. What about the technical helpdesks? Should MACs be supported, just like a PC, on campus? Bare minimum all courses and training materials should have images. Audio and video of course is the next step. Let's talk about images though for now. Adding images increases the retention of information. It's part of Dual Coding. Think of this, when you hear a fairy tale, you can picture something completely different from your sibling. The same is true for training materials or educational materials. Images can help us be on the same page. Medina explains that images are more informative than just text. Additionally, she states that Americans have less time to read. We also have the tendency to still read the newspaper. (Medina, Vision: Rule #10; Vision trumps all senses.) Providing images really improves the reading experience for the learner as well as keeps them captivated. I tried out iMovie for the first time in a course in the Summer of 2011. It's a great tool and very easy to pick up and utilize. Below is the production of my trial. In the course, we were given a story and then asked to finish it. The narration at the beginning is the story that we were asked to complete. While the story line and the cooking show are not serious, I noticed that iMovie provided me with lots of options. For MAC users, I definitely suggest using iMovie. It's free, easy to use, and easy to export into YouTube.